With just a little over two weeks to go before the start of CHALLENGE ALMERE-AMSTERDAM, the Australian Cameron Wurf has not only confirmed that he is racing, but also that he wants to attack the race record. Among the women, last years winner Yvonne van Vlerken has the same goal. Wurf’s participation substantiates the organization’s ability to attract a professional triathlete who is not only interested in a win but is capable of breaking the race record. Wurf is a former professional cyclist, who switched to triathlon in 2016. In 2018, he started in multiple long distance races and won several podium places, which included a second place at CHALLENGE VENICE at the beginning of June. He finished that race in a time of 8:15:12, just a week after he won at CHALLENGE SALOU. ,,I'm really excited about doing the race, I have some new equipment (bike, clothing) to test which will be the first time it's been seen." The race record in Almere has been in the hands of Jan van der Marel since 1999. It took Van der Marel 7:57:46 to finish as the fastest triathlete in Almere ever. However, the current course is ideal for a fast cyclist like Wurf. The Australian can expect a lot of competition from Dane Kristian Hogenhaug (last year's fastest cyclist), Irishman Bryan McCrystal, Slovenian Jaroslav Kovacic and Dutch man Evert Scheltinga. Despite the strong male pro field, the lowest bib numbers will be given to the female professionals. 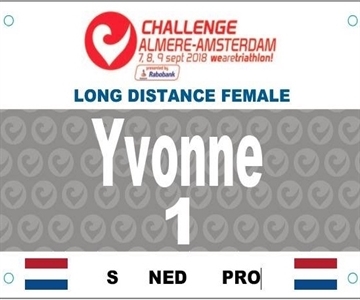 Last years winner, Yvonne van Vlerken, will be racing with the very popular number 1. She has already announced her intention to attack her 8:51:13 race record, which was set last year. ,,I had an excellent race last year, so everything has to be right to beat my own record. In any case, I'm incredibly motivated to race as fast as I can. My primary goal is to win, even if there will be a lot of strong contenders." In the strong female pro field, one of the most dangerous opponents for Van Vlerken will be Els Visser. At the beginning of August, Visser won Ironman Maastricht where Van Vlerken came second. Camille Deligny, the 2016 winner of CHALLENGE ALMERE-AMSTERDAM, is also a strong contender for the win. Van Vlerken will carry CHALLENGE ALMERE-AMSTERDAM in her heart forever. ,,Yes, this race means a lot to me. Since 1999 I have stood here, watching and cheering. Here my dream to become a Long Distance pro was born. This is where my inspiration came from. It is a race with history. And a race that suits me. This race comes with a lot of emotions and happy feelings for me." According to Van Vlerken, no one should miss CHALLENGE ALMERE-AMSTERDAM. ,,The event has grown tremendously since joining CHALLENGE FAMILY. It's amazing. This is good for our sport, not only in the Netherlands, but also worldwide. A competition with an organization where everything works this well is amazing."